408 pages | 11 B/W Illus. Introduction: Women and Sport or Women’s Sport? 1. Victorian Sporting Variety, Women’s Education and Writing 2. The Olympic Games, Popular Imperialism and the "Woman Question" 3. An Age of Speed 4. Football Interconnections and Olympic Parallels 5. "For the Most Part, the Team Was Given Private Hospitality of the Most Lavish Sort": Women's Hockey, Brooklands and Aspects of Empire 6. Women, Sport and Culture: From the 1948 London Olympic Games to Rome 1960. Conclusion. Appendix 1: Clubs Belonging to the All England Women's Hockey Association in the 1899-1900 Season and Their Colours. Appendix 2: Dorothy Gwyn Jeffreys; Winifred Gwyn Jeffreys and Edith M. Thomson Hockey Jottings (unpublished: Kensington, London circa 1898). All England Women's Hockey Association (AEWHA) File D/1/ 1 Bath University Archive and Special Collections, Bath. Appendix 3: Women’s Participation in the Modern Olympic Summer Games 1896-2004. Appendix 4: Schedule of International Federation of Women's Hockey Associations (IFWHA) Conferences 1930-1983. Appendix 5: Scotland versus Ireland Programme 23 March 1935 at Glasgow High Schools' Club Ground, Old Anniesland. Appendix 6: Wales versus England Programme 10 March 1935 Merton Abbey, Wimbledon. Appendix 7: England V South Africa Programme 28 November 1936 Merton Abbey, Wimbledon. Appendix 8: The Brooklands Racing Careers of Some Prominent Women Drivers Between 1920-1938. The Routledge Research in Sports History series presents leading research in the development and historical significance of modern sport through a collection of historiographical, regional and thematic studies which span a variety of periods, sports and geographical areas. 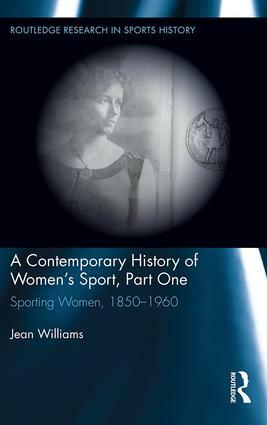 Showcasing ground-breaking, cross-disciplinary work from established and emerging sport historians, the series provides a crucial contribution to the wider study of sport and society.